Pianist Lucian Ban and violist Mat Maneri are preparing another duo album, a follow-up to their 2013 release Transylvanian Concert (ECM). “We’ve been working up material for three or four years,” said the Romania-born Ban, who appears with Maneri at Gig Performance Space on Saturday, Oct. 28. Maneri said the music they’ve considered includes pieces by Romanian classical composer George Enescu; mythic big-band leader and composer Sun Ra; drummer and composer Paul Motian, as well as Romanian doinas, local folk music with detectable Middle Eastern influences. “More intimate pieces,” Maneri explained. In 1969, the world of rock ‘n’ roll was shattered by the heavy, progressive sound of King Crimson. Following a legendary gig in Hyde Park where the band blew away the Rolling Stones, King Crimson toured the U.S. before imploding due to personality clashes and artistic differences. The band re-formed and played until 1975, when it entered another period of dormancy. In 1981, founding guitarist Robert Fripp reconvened the band, using bassist Tony Levin as the foundation for further attempts at moving rock into the future. The noirish, dystopian sound of the eighties lineup was a perfect match for the darkness of the Reagan/Thatcher era. Beyond King Crimson, you’ve almost certainly heard Tony Levin’s playing, even if you don’t know it. He is the bass player for all of Peter Gabriel‘s solo albums and appears on Alice Cooper’s first three records. He’s played with David Bowie, John Lennon, Pink Floyd, Paul Simon, and has appeared on hundreds of other landmark LPs over the years. As Britain attempts what seems like an ungainly improvisation out of Europe, American artists more adept at the art are thankfully still finding a way into the old continent. With his residency in this well-appointed restaurant in the vast cultural centre of La Villette in Paris extending for no less than two weeks, Chicago alto saxophonist-composer Steve Coleman appears a cipher of a more worthwhile politics against the backdrop of Brexit and Great Britannia, be it an ally of rulers or an enemy of rules. 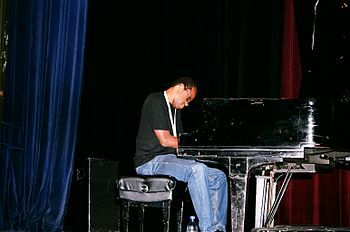 The second episode features an interview with pianist Matthew Shipp. Shipp has been one of avant-garde jazz’s most compelling figures since coming to public attention in the early 1990s. He frequently releases multiple albums in a year, mixing solo performances with ones by his current trio, which features bassist Michael Bisio and drummer Newman Taylor Baker. In 2017 alone, he has released a trio album, Piano Song; a solo album, Invisible Touch at Taktlos Zürich; Vessel in Orbit, a collaboration with drummer Whit Dickey and violinist Mat Maneri; This is Beautiful Because We are Beautiful People, a collaboration with saxophonist Mat Walerian and bassist William Parker; Magnetism(s), a reissue of a 1999 disc with Parker and saxophonist Rob Brown, paired with a brand-new live performance by the same group; and an astonishing 11 albums in collaboration with saxophonist Ivo Perelman. On November 2, Marian McLaughlin and Heterodyne will perform at Four Hour Day Lutherie, which is located at 4305 Harford Rd. in Baltimore. The performance starts at 7:30, admission is $5 and all ages are welcome. Heterodyne’s performance will be complemented by readings by renowned poet Dan Gutstein. Heterodyne (https://the-heterodyne-project.tumblr.com/ ) is off to a remarkably fast start, particularly given that it’s a totally non-mainstream project! We formed on July 28; since then, we’ve performed at Baltimore’s MONDO Collective (twice); High Zero Foundation’s Red Room, Galaxy Hut and St. Stephen and the Incarnation. Upcoming performances include Dew Drop Inn DC, VisArts in Rockville, RhizomeDC (twice) and Baltimore’s very special An die Musik. The music that comes through us is unscored, unrehearsed and improvised extemporaneously on the spot, so no two performances are the same. Dan Gutstein (https://en.wikipedia.org/wiki/Daniel_Gutstein) is a renowned poet; the author of two collections, non/fiction and Bloodcoal & Honey . Dan’s writing has appeared in 100 journals and anthologies. Dan has taught at a number of colleges and organizations, including George Washington University and the Smithsonian. More at http://dangutstein.blogspot.com/.